Yeah, but: Far, far better than it looks. The Long Version: It's a small town thing, I'm sure - next to the boat launch in Killarney, Ontario, is Gateway Marine & Storage, which is also a restaurant and a bakery. It's on Channel street, in the heart of the downtown core: not only are there plenty of boat slips nearby, there's also the local LCBO and the best fish & chips truck in town. 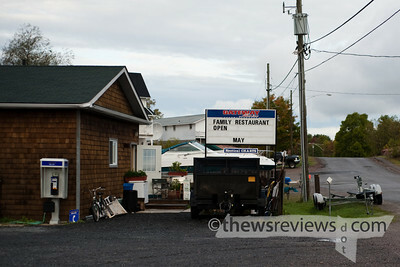 Gateway certainly has the authentic small-town charm, with cheeky signs on the wall and fairly basic fixtures. 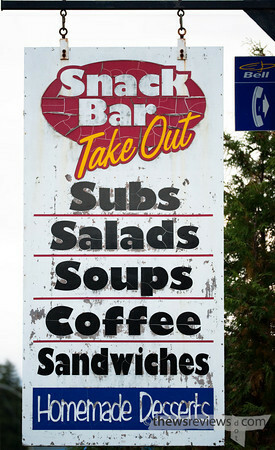 It also serves the best cheeseburger that I've ever had. The hamburger patties are home-made, and it's served with cheese and a slice of peameal bacon. The buns are also fresh - it is a bakery, after all - and make a huge difference. For $7, it doesn't include french fries, but in the interest of a well-rounded diet I spent the little bit extra. They're from a package, but the way they're cooked makes them remarkable as well. Granted, it was after 3pm, and I'd spent the morning tromping through the woods after a moderate breakfast, so I was pretty hungry. It's still the best meal I've had in ages. The next day I took a gamble - I came back and had another cheeseburger. It was a risky move because if it didn't live up to my memory, it wouldn't just be disappointing, it would retroactively diminish the burger that I'd already had. But I worried for nothing, and the second one that was prepared during the lunch rush with only limited electricity was just as good as the first. The three friends that I was with had caught my enthusiasm and also had the cheeseburger, and none of them were disappointed. Other people that I heard from raved about the strawberry-rhubarb pie, sticky buns, and garlic bread. The next time I'm in Killarney, if the bakery at Gateway Marine is closed, I just won't eat.